I remember coming here as a young kid in the mid to late 50's. My father Gorden Drooger and Uncle Junior Terpstra raced here. My Grandmother owned the Motel/Restaurant called Glenwood just south of the track on Bluestar Highway, She told me she remembered a bunch of the drivers use to come in after they raced. One was Gorden Johncock who went on to win the Indy 500 twice, he was also good friends with my Dad. My Uncle Mike Mankin from Allegan raced a blue #51 there. He probably raced stock on a shoestring budget. My parents took a photo of me standing on his seat wearing his white helmet, looking out the window holding the steering wheel. I was hooked on racing at 3 yrs old. 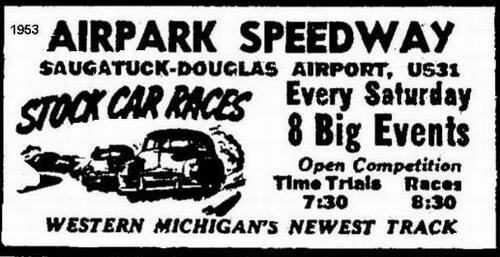 FOR AN EXHIBITION AT Saugatuck MI Museum Looking for photos and any info on Air Park Speedway, Douglas-Saugatuck Mi in the 1950s-1960. Also did Bob Muhlke's 1963 events take place at some track? THANKS. Drove my first sprint car here, even if it was a six-cylinder sled during intermission on a very muddy track. It was a start. The speedway was about 2 miles South of Douglas on the E. side of US31. It was a 3/8 dirt track with quite a bit of bank. It had Lights for night racing. It was a fast neat race track. Pits were outside the 1st turn. In the 50s they ran 3 classes of cars, Stocks, Modifides and Super Modifides. Some drivers names I recall are Glen Rocky, Jim Murphy, Junior Turpstra, Norm Nelson, Bob DePaw, The Lockwood bros. , the Vilwalk bros.
, Dale Adams, The Covey bros. , Ralph Baker, Chuck Grano, Chuck Neal, Gordon Vanderbeak, Butch Gould and lots more. 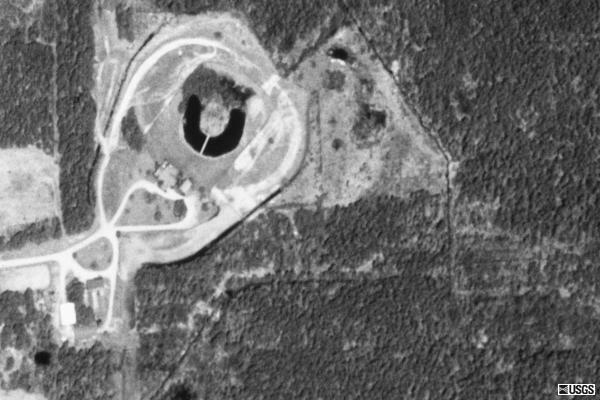 The Track ran Friday nights, in the late 50s Hartford was re-built with a bank added to the track and lots of the cars started running there instead of Airpark. Outside of a music Concert I dont recall of any event that was held there after 1960. Thru the years it gradually turned into a Blueberry farm.